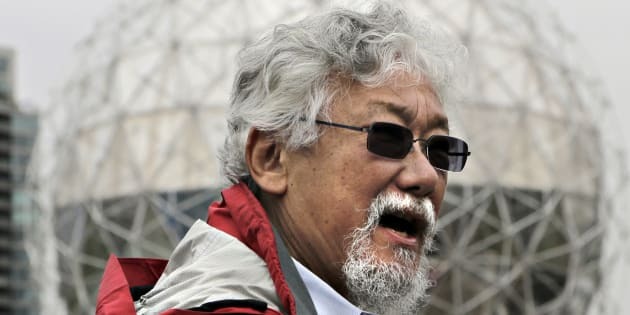 Canadian environmentalist David Suzuki talks to media during a news conference in Vancouver, B.C., June 4, 2012. When I wasn't paying attention, another environmental group — Blue Dot — began expanding, joining the many other large Canadian groups claiming it has the right strategy to help save Canada from environmental devastation. An initiative of the David Suzuki Foundation, Blue Dot says it "focuses on building a groundswelling of support to convince Members of Parliament to introduce 'a gold-standard federal environmental bill of rights.'" Blue Dot also urges municipalities to adopt a pro-environmental position, and it hopes to pressure Parliament to amend the Charter of Rights and Freedoms to include environmental protection. Hey, this shouldn't be hard! Just kidding. A dozen or so other groups have been working on the same goals for at least a dozen years with little success. With only 115,000 individual members — but still growing — and modest funding, I don't see how Blue Dot can be more effective than any of the others in fighting *climate change. 'Kayaktivists' hold up banner protesting plans by Kinder Morgan to build a pipeline during a water-based 'pipeline resistance training camp', held by Greenpeace and the Mosquito Fleet (a Pacific Northwest 'kayaktivist' group) in the San Juan Islands, in the waters just off the U.S.-Canada border on Aug. 26, 2017. Canada is seriously failing to meet its carbon emission reduction targets. Moreover, a government that claims to be fighting ecological collapse supports development of the tar sands. "Canada, which represents one-half-of-one-per-cent of the planet's population," writes an angry 350.org head Bill McKibben, "is claiming the right to sell the oil that will use up a third of the earth's remaining carbon budget." Scientists say that if the world is to hold global warming to below two degrees Celsius this century, every bit of fossil fuel should remain in the ground. A two-degree increase could spell catastrophe, scientists warn — through drought, ocean rise, crop failure, wildfire, flooding, and disease. Faced with this frightening information, you would think that the environmental community would be well organized and have effective strategies in place. Individual groups complain that they lack funds, but if they worked together and cut out overlap and duplication of programs, much more money would be freed up. With the creation of Blue Dot, Canada has at least seven networks and 17 organizations that claim to be fighting ecological collapse. They seldom, if ever, work together. In fact, they are just as likely to see other groups as rivals. They don't tend to share campaigning information. They compete for funding. The bosses protect their own isolated empires. The largest groups have tremendous capacity. Six of the largest groups employ roughly 180 people. The approximate number of employees are in brackets: The David Suzuki Foundation (60), Environmental Defence Canada (25), Greenpeace (20), Canadian Parks and Wilderness Society (18), World Wildlife Fund of Canada (36), and (20). And some have identical goals and similar campaigns. I researched the funding of groups registered with Revenue Canada and discovered that, in 2014, the country's top environmental and conservation groups received $20 million, much of it in the form of donations from committed individuals. The environmental-climate change groups have three national networks and several regional ones. Most groups belong to the Climate Action Network (CAN). CAN has more than 100 members, but when it comes to action, it's pretty much a do-little network. CAN doesn't bring together the power of its members to take action. It's mainly a communications vehicle that shares groups' information. It claims to lobby government, but my impression is that it complains politely. It has a conflict of interest because it is partly government funded. Groups and the network need to change radically if they hope to have any success at all fighting ecological collapse. To begin with, there needs to be a dramatic change in attitude. Even though we are facing climate calamity, groups don't put themselves on the line. They're too Canadian-polite. They're not in the right place psychologically to deal with the crisis. They should be on an "at war" footing. They need to acknowledge that we are in a life-and-death situation! Even though we are facing climate calamity, groups don't put themselves on the line. They're too Canadian-polite. First, groups could hold staff meetings, write the term "climate calamity" on the blackboard, and start talking about what can be done to slow carbon emissions from Canada. Then, facilitated by a hard-nosed campaign strategists, groups need to meet together and start developing joint strategies. They need to be less reluctant to confront and attack the people and institutions that are blocking change. The best results would almost certainly come from working together and developing joint campaigns, probably through the Climate Action Network. Twenty-five groups representing millions of Canadians would be hard to ignore. A demonstrator carries a sign in protest against the Northern Gateway pipeline project during a "no" to the Enbridge pipeline rally at English Bay in Vancouver, B.C. May 10, 2014. Sit-ins? Disrupt government communications? Targeting the country's worst fossil fuel corporation? All possibilities need to be discussed. Right now, with no serious opposition, Prime Minister Trudeau and the corporations know they can do as they please. If groups can become less concerned about protecting their own interests, they could easily re-allocate $1 million to launch a meaningful campaign. Groups need to re-evaluate the difficult problem of motivating the public about ecological collapse. Because they are afraid to discourage people, many groups in Canada and elsewhere never tell us the real seriousness of ecological collapse. I don't think this is the right approach anymore. On one hand, groups ask people to get involved in supporting their work, on the other hand, they say people shouldn't worry too much. It's no surprise that people aren't motivated. Only 57 per cent of Canadians say the country should do more to address climate change (term used in the poll). A September Abacus Data poll suggests that perhaps only 22 per cent of Canadians are radicalized on the issue. On one hand, groups ask people to get involved in supporting their work, on the other hand, they say people shouldn't worry too much. A lot of time has been lost, but the movement should immediately start telling the truth about the destruction that's coming, and rally as many Canadians as possible. Folks who donate money to groups working on fighting ecological collapse should reconsider their donations until improvements have been made. The environmental community will be angry and in denial about this article. After they calm down, it will be great if they realize they must go through a revolutionary process.